According to the CME Group's quarterly dividend futures, the rate at which S&P 500 dividends are growing will peak in the current quarter of 2019-Q2, then will go on to decelerate through mid-2020. The deceleration becomes more apparent when we track the trailing twelve-month sum of quarterly dividends, the portion covered by dividend futures currently anticipate a peak in 2020-Q1 followed by a potential decline that would take hold in 2020-Q2. 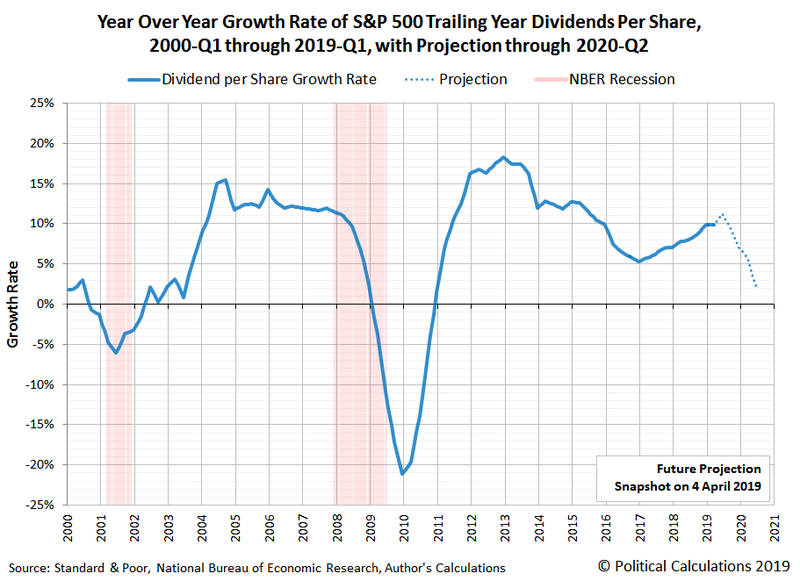 Between now and then, the year-over-year growth rate of S&P 500 dividends per share is projected to decline relatively sharply, falling from double-digit growth rates to the low-single digits. Standard and Poor's bills the S&P 500 (Index: SPX) as "the gauge of the market economy." 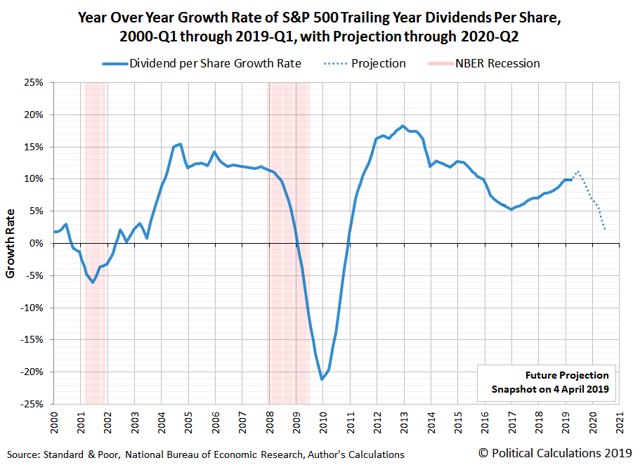 And if you consider the direction of dividends in the 21st Century, you can see that's a pretty reasonable statement, where downturns in dividends tend to coincide with periods of recession. 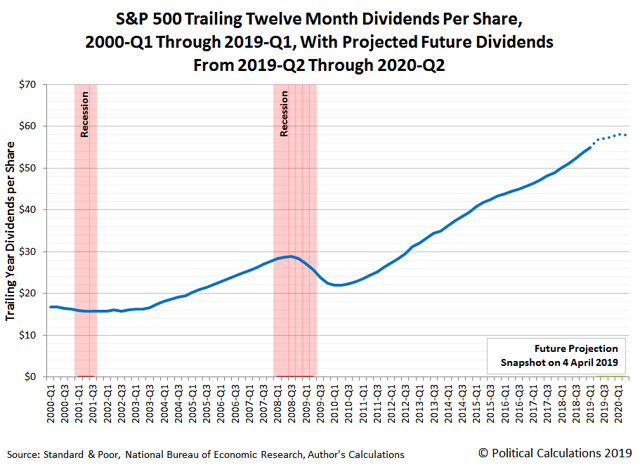 There's a lot of time between now and mid-2020 for expectations of future dividends to change. Which direction do you think they will, and what will that mean for the trajectory of today's stock prices? Silverblatt, Howard. Standard and Poor's. S&P 500 Earnings and Estimates [Excel Spreadsheet]. Accessed 4 April 2019. CME Group. 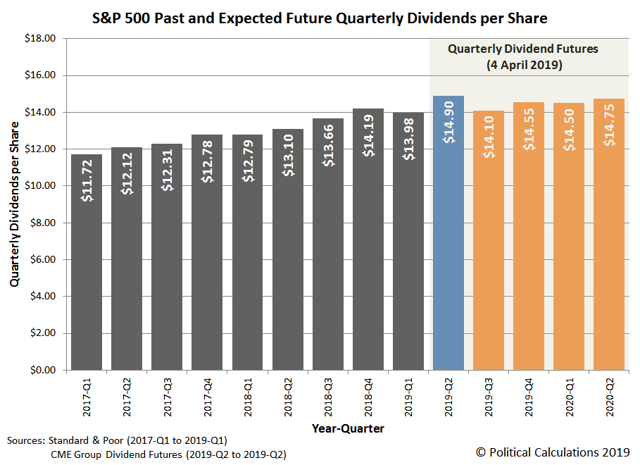 S&P 500 Quarterly Dividend Futures [Online Database]. Accessed 4 April 2019.